Ralph J. Rispalje passed away unexpectedly on Monday, April 8, 2019. He was 87 years old. He was born on September 22, 1931 in Milwaukee, Wisconsin. Ralph was united in marriage on May 2, 1953 to his first love, best friend and love of his life Beverly (nee Melchiori) Rispalje. Ralph was employed at American Can Company for 38 years. 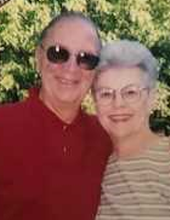 Ralph and Beverly enjoyed numerous trips together. On one of their many trips, they were extras in the Rocky III movie. Whether it was their yearly vacation or one of their 546-day trips, they always made the most of their time together. Bingo was a favorite pastime as well as spending cherished time with family. Ralph is survived by his loving wife Beverly, children Candy (Mark) Ritger and David (Ann) Rispalje, two grandsons Stephen and Andrew (Liz) Rispalje, brother Robert (Betty) Rispalje, brother-in-law Louis (Mary) Melchiori. He is further survived by nieces, nephews and other relatives and friends. Ralph is preceded in death by his mother Viola and parents-in-law George and Alma Melchiori. A Funeral Service will be held at First Immanuel Lutheran Church W67N622 Evergreen Blvd. Cedarburg, WI 53012 on Friday, April 12, 2019 at 6:00 PM. The family will receive visitors from 4:00 PM until the time of service at 6:00 PM. Pastor Wil Reichmann will officiate. A private family burial will be held at Pinelawn Memorial Cemetery. In lieu of flowers, memorials suggested to the Diabetes Foundation or Parkinson’s Foundation. To send flowers or a remembrance gift to the family of Ralph J. Rispalje, please visit our Tribute Store. "Email Address" would like to share the life celebration of Ralph J. Rispalje. Click on the "link" to go to share a favorite memory or leave a condolence message for the family.